Most readers first memory of Dee Wallace is as the wonderful Mom in everyone’s favorite alien movie, E.T.This book, however, is a serious ‘curve’ in what Dee Wallace, with her acting, has come to represent. 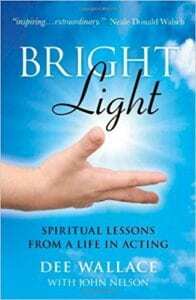 In this spiritual autobiography, Dee Wallace actually ‘draws’ readers into her world, and soon the reader is hooked - as chapter after chapter becomes a self-help guide full of fun, entertainment, interesting remarks, and core truths that can help anyone to live a better, “brighter” life. The journey of each life - the path we choose for ourselves as we grow - is a concept that Dee Wallace covers. In her own words, she tells of various aspects and issues in her own life that led her to where she is now. Her intuitions about things in the Hollywood industry, as well as stories of her auditions and how her feelings about them would generate energy while in a room with casting people, are among the stories that are told. Dee also talks a great deal about her home, her family, and where she came from. Although there were pitfalls and problems, as with any family, she credits them for her strength and her strong morals - which certainly came in handy in a “world” that sometimes is certainly not known for its moral fiber. The writing is very deep and intense at times, but Ms. Wallace has the power to automatically switch gears and offer humor, fun, and a look inside the Hollywood land that we all envy, in a way. She also has a firm grip on reality and how all people lose their way. But, with her eloquent words, Dee Wallace shows how people can find the power that they have within themselves to come back from any situation. Quill Says: An interesting read from an interesting and inspiring woman.